You perhaps read it before somewhere else as I am pretty late on this, but Arctic sea ice melt to a worrying extent this summer and almost beat last year’s record. But according to the people from the WWF, the extent may not be as small as last year, but in terms of thickness – and thus of amount – this summer broke all records. it is normal for temperatures to keep on rising as our greenhouse gases emissions keep on doing so. It seems this phenomenon won’t end anytime soon. 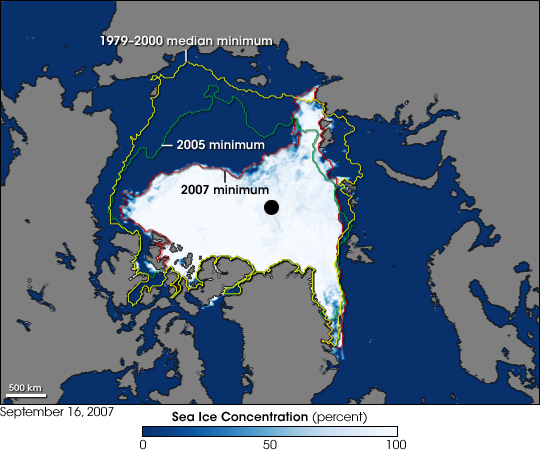 Still, the scientists, at the National Snow and Ice Data Center in Boulder, Colo., said that the extent of the ice in the Arctic this summer was 33 percent smaller than the average extent tracked since satellites started monitoring the region in 1979, and that the long-term trend is toward an ice-free summer in the Arctic Ocean within a few decades. This summer also was notable because scientists confirmed that two fabled shipping routes, the Northwest Passage past Canada and the Northern Sea Route past Russia, were briefly open simultaneously. The ice, which is now expanding again as the sun dips toward the horizon for the winter, hit a minimum extent of about 1.74 million square miles on Sept. 12, said Walter Meier, a research scientist at the center; in 2007, he said, the minimum extent was 1.59 million square miles. (…) Dr. Meier said that small variations from one year to the next are less significant than the long-term trajectory, which remains toward progressively more open water. “It’s hard to see the summer ice coming back in any substantial way,” he said. (…) Everyone I queried stressed that the retreat this year, while not a new modern record, does mean that the downward trend in ice cover is still on track to reveal an entirely open ocean in summers within a few decades. Of course, trend is not destiny. But it’s clear that the Arctic of our history books is not — for better or worse — the Arctic that our children will inherit. “If you take reduced ice thickness into account, there is probably less ice overall in the Arctic this year than in any other year since monitoring began,” said Martin Sommerkorn, WWF International Arctic Programme’s Senior Climate Change Advisor. (…) Dr Sommerkorn said the continuing loss of older, thicker ice means that the Arctic ice cover is following a trend of becoming younger and thinner each year. The area of ice that is at least 5 years old has decreased by 56% between 1985 and 2007. The oldest ice types have essentially disappeared. Taken together, the new figures clearly show the Arctic is experiencing the continuation of an accelerated declining trend. (…) The trend of melting Arctic ice is also alarming for the rest of the world. “The Arctic is a key factor in stabilising the global climate,” Dr Sommerkorn said. “Arctic ice is like a mirror, reflecting the sun’s heat back into space. As that ice goes, Arctic waters absorb more heat, adding to global warming. The governments of the world are currently negotiating a new climate agreement to come into force from 2013 when the first phase of the Kyoto Protocol has ended. “Governments must speed up these talks and agree the new climate deal at the UN Summit in Copenhagen in December 2009, just 15 months from now, Dr Sommerkorn said. As I see the extent of the issue, I believe it is high time for me to find the article I read last year on how to cool back Earth’s climate. To what I remember, there are three or four solutions, with one being quite realistic and feasible. I will soon write something on this topic, so for this and for much more, stay tuned !